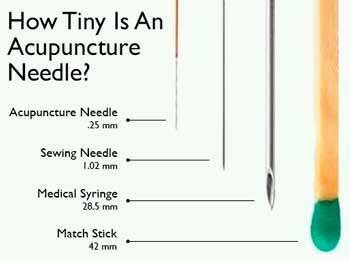 Here is a size comparison so you can see how thin acupuncture needles are compared to other familiar items. The red handled needles I use are even smaller than the one in this image, they are 0.16mm in thickness which is a bit thicker than human hair. I always want you to be comfortable with anything I do, so if it hurts, I'll change it. One question I get is about bleeding. The needles are so thin I only rarely get any bleeding. And if there is some, it is rarely more than a drop or a small bruise. All needles are pre-sterilized and single use. If you have any questions, please don't hesitate to call!